FREE Expedited Premium Shipping and Handling (up to 3.5kg=7.7lbs, value $14.95) is provided on all orders over $99.00 before taxes. If any order exceeds the FREE Expedited Premium Shipping and Handling 3.5kg weight you will be charged a pro-rated "per additional kilogram rate". This "exceeded weight" amount is automatically calculated during the checkout process of your order. We love your business, so we love providing you FREE SHIPPING where we can! What if your order is under $99.00? NO PROBLEM, all orders under $99.00 before taxes will be shipped out at our low premium flat shipping and handling fee of $14.95 (up to 3.5kg=7.7lbs). If any order that exceeds 3.5kg will be charged a pro-rated "per additional kilogram rate”. This "exceeded weight" amount is automatically calculated during the checkout process of your order. DO YOU WANT YOUR ORDER RUSHED? Do you want your order RUSHED? Then use the SupplementsCanada’s “Express Post Premium Shipping and Handling” option on the drop down menu of your checkout page. 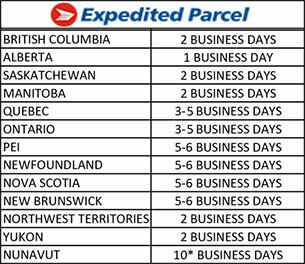 SupplementsCanada’s Express Post Premium Shipping and Handling is an additional shipping rate starting as low as $24.95 (up to a 3.5kg=7.7lbs). If any order exceeds the Express Post Premium Shipping and Handling 3.5kg weight you will be charged a pro-rated "per additional kilogram rate". This "exceeded weight" amount is automatically calculated during the checkout process of your order. Please enjoy using the SupplementsCanada’s Express Post Premium Shipping and Handling option - we want to get your order to you as fast as possible! Daily order processing cut off time is 2:00pm MST*. All orders are processed and shipped within 24 hours of receiving your order pending any order discrepancies, larger volume days due to special sales or offers, weekends, statutory holidays and within our normal business shipping hours Monday-Friday 9:00am-5:00pm MST. Canada Post will provide you a direct email of your order shipping status "that includes your ORDER TRACKING NUMBER", a link to their package TRACKING WEBSITE (www.canadapost.ca), and an ETA of your order arrival date that is within 2-5 business days of this Canada Post confirmation. *NOTE: We have the right to refuse any order placed that has a destination postal code which is within our remote rural shipping regions, exceeds a weight, or exceeds our maximum box size, this order maybe subject to an additional charge. If so, you will be contacted to discuss any additional charges. Our Express Post Premium Shipping and Handling option is pending any order discrepancies, weekends, statutory holidays and within our normal business shipping hours of Monday-Friday 9:00am-5:00pm MST. 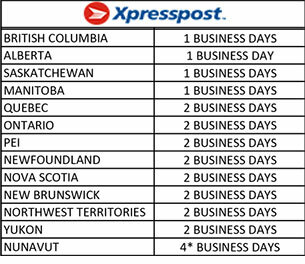 If an Express Post Premium Shipping and Handling order is received outside of these normal shipping hours then the order will receive Express Post Premium Shipping and Handling the next business day. The warehouse is closed to the public. We only ship orders within Canada. We do not accept international orders. We reserve the right to refuse any order.